The overall objectives of the Problem drug use (PDU) expert meeting were to share latest developments on problem drug use in Europe and beyond, and to identify as a network the steps needed to improve the production of public health oriented information at the European level. The specific objectives were to exchange information and propose activities to consolidate national core prevalence estimates (in particular people who inject drug (PWID) in the context of Hepatitis B&C elimination plan), to illustrate how the integration between the PDU indicator and other indicators is useful for public health and to explore innovative methods to strengthen the PDU indicator. Participants of the meeting were the PDU national experts from the European Union Member States, Norway, Turkey (excused), six candidate countries and European neighbourhood policy partners (Albania, Bosnia and Herzegovina, former Yugoslav Republic of Macedonia, Montenegro, Serbia and Ukraine), expert guests from France (Observatoire Français des Drogues et des Toxicomanies), Germany (Robert Koch Institute), Hungary (ELTE Eötvös Lorand University), the United Kingdom (University of Bristol), the United States (University of Maryland and Pardee RAND Graduate School) and the EMCDDA scientific units. 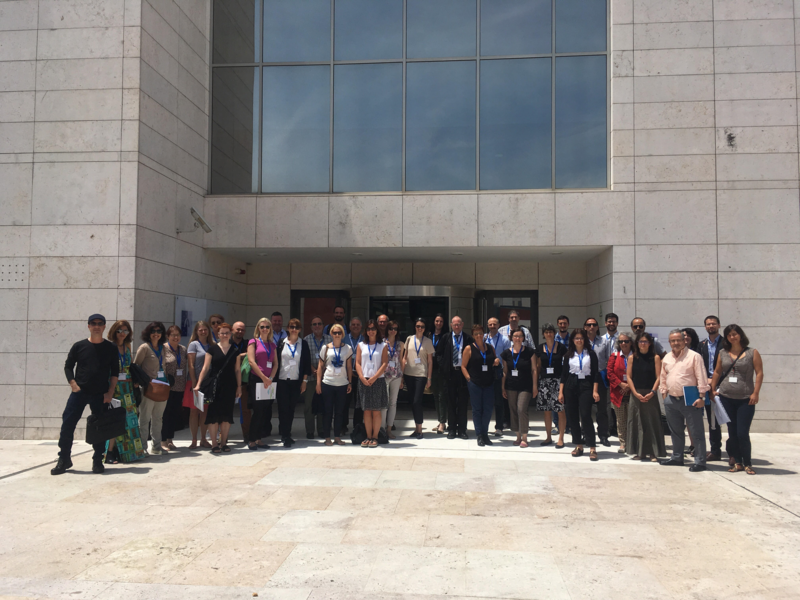 The meeting took place at the EMCDDA, Lisbon, on 8-9 June 2017. The PDU indicator is one of the five key epidemiological indicators of the EMCDDA. The key indicators are used by the EMCDDA to report on trends and developments in the EU drug situation. The PDU network brings together national experts nominated by national focal points from 36 European countries (28 EU Member States, Norway, Turkey and six candidate and potential candidate countries). Experts come from ministries of health, home affairs, justice, public health institutes, drugs agencies, universities and hospitals. This unique network provides action-oriented information in the field of problem drug use for EU institutions, Member States and professionals. One of the core tasks of the PDU network is to share national estimates on problem drug use, as defined by ‘recurrent drug use that is causing actual harms to the person or is placing the person at a high risk of suffering such harms’. Definitions of estimates that are included under the PDU key indicator umbrella are set out in the PDU revision summary document. Among these estimates, people who inject drugs (PWID) and high-risk opioid use (HROU) are among the most important for public health policymakers. By measuring the prevalence of actual or potentially harmful drug use, the PDU indicator is also closely linked to the other key indicators (Drug-related deaths and mortality among drug users (DRD), Drug-related infectious diseases (DRID), the Treatment demand indicator (TDI) and General population surveys (GPS)). This year, one of the meeting’s focuses was on PWID estimates. PWID estimates constitute useful information for policy makers in the context of the hepatitis B&C elimination strategy. Thematic sessions looked at PDU and children and misuse of prescription medicine in Europe. This later is particularly relevant in the light of the opioid public health crisis currently affecting the US. Consolidate: National experts from France (single source method), Cyprus (single source method) and Norway (mortality multiplier) presented their new national PWID prevalence estimates. The national expert form Ireland (4-source capture recapture) presented the new HROU prevalence estimate. National experts from Hungary presented an analysis of residues from used injecting drug paraphernalia (2015-16) that confirmed the pre-eminence of synthetic cathinones among injectors in Hungary. The national expert from Belgium reviewed 10 years of monitoring the characteristics and risk behaviours among a sample of clients of needle and syringe exchange programmes. The EMCDDA DRID expert illustrated the usefulness of PWID estimates in the context of hepatitis B&C elimination plan. National experts from Croatia, Estonia, Lithuania and Slovenia provided an update on planned or on-going studies estimating PWID estimates in their countries. Integrate: Experts from Austria, The Netherlands, the US (Pardee RAND Graduate School and University of Maryland) and the EMCDDA used a multi-indicator approach to answer questions on: the ageing cohort of opioid users (Austria), overall trends (The Netherlands), cocaine use (US), opioid trends (US) and high-risk drug use and new psychoactive substances (Europe). Experts from Hungary (ELTE Eötvös Lorand University) presented the results of ethnographic field work conducted among marginalised families in rural communities vulnerable to high-risk drug use, while the Italian national expert integrated data from treatment centres, hospital admissions and drug law offences to quantify the increase in high-risk drug use among minors. National experts from the Czech Republic and France (including TREND data) described some aspects of the recent increase in misuse of opioid analgesics. The Spanish national expert looked at the profile of problem hypno-sedative users based on general population surveys. Innovate: Experts from Greece and the UK (University of Bristol) critically reviewed some of the key assumptions of the capture recapture method and proposed strategies to improve its implementation. The expert from the Robert Koch Institute showed how respondent-driven sampling (RDS) was used to recruit PWID in 8 cities in Germany and discussed the representativeness of the obtained sample. The national expert from Spain explored how population surveys can provide useful descriptive insights into poly-problematic drug use. The EMCDDA presented the trendspotter study on high-risk drug use and new psychoactive substances. More presentations and reports are available on the PDU restricted web-page.